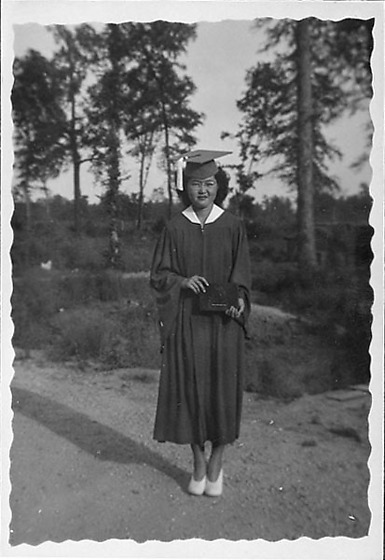 Spectacled young woman stands in graduation motorboard and gown and white pumps in open area in front of trees at Rohwer concentration camp, Rohwer, Arkansas, 1942-1945. Dressed in a dark tea-length gown with a white collar and white tassel hanging on the proper right of her cap, she faces the viewer holding a diploma in porfolio in front of her at waist level. Shrubs and trees in background. Image has irregular scalloped border.